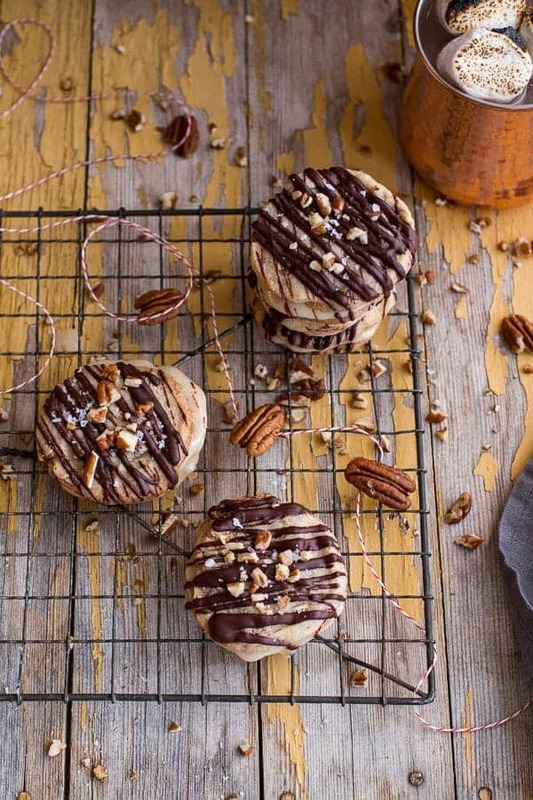 Chocolate Drizzled Buttery Pecan and Caramelized Condensed Milk Cookies. I know that it’s not quite the official cookie season yet, but we are so close. So close that I am actually getting sad that it will be over soon… I know, I know. Also, who does not love cookies? Cookies are good at ALL times. I didn’t really mean for these cookies to happen, but then they did, because the name buttery pecan just sounded so delish. Plus, I was dreaming of these cookies I made way back in my first couple of months of blogging. Horrible photos – dang good cookies. AND, it was a snowy, cold day and cookies + maybe just a little hot chocolate are a must on snowy, cold days. I will not deny that I seem to make the best baked goods when it is snowing. I know that my family back in Cleveland needs some cookies… I heard their Halloween was windy, cold and “miserable” as my Nonnie put it. And, from all the family texts, it looks like my Uncle Matt is feeding my cousin Maggie, AKA Marge, way too much salmon and not enough um well, chocolate… or butter. Or better yet both. Salmon is good and all guys, but it’s best when followed by cookies. Really now, it’s pretty much the holiday season and we all could use some cookies to get things into gear. Not to mention that it’s Friday, everyone needs a cookie by Friday! 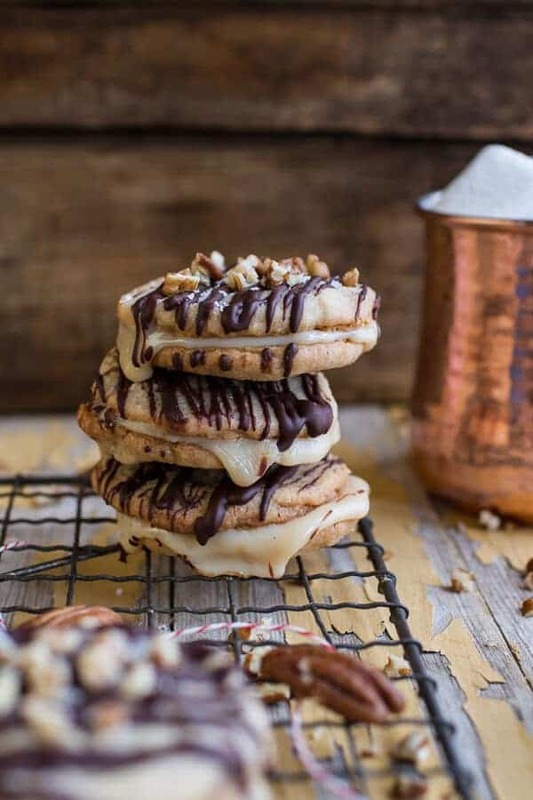 Plus, the whole buttery pecan thing makes these sandwich cookies pretty perfect for the month of November. In my head pecans are so a November kind of food. Pretty sure this is due to that beloved chocolate pecan pie we eat every Thanksgiving. Fruity pies are no go in this house. It’s all about the chocolate. Anywhooo. 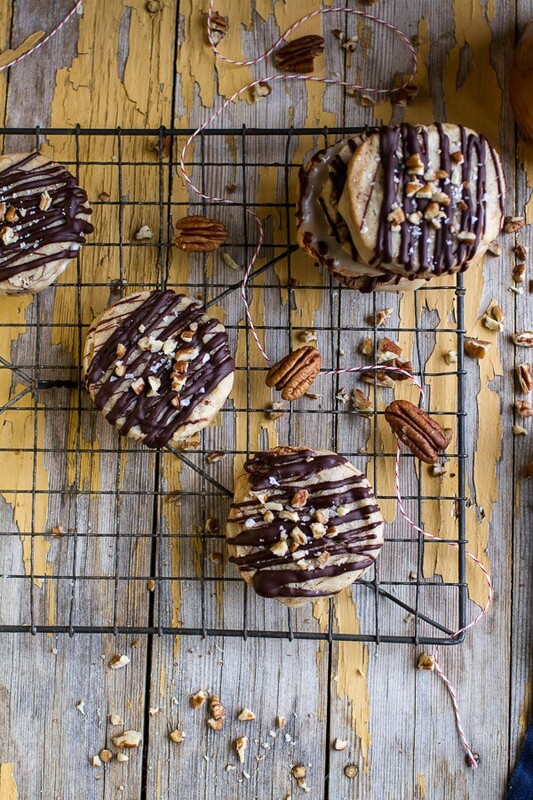 I want to tell you all about these Chocolate Drizzled Buttery Pecan and Caramelized Condensed Milk Cookies. Clearly I love them. They are different from most cookies I make because they are a shortbread base. Honestly, I am not normally a shortbread cookie person, but these cookies just work. Maybe it’s all the butter, all the pecans, or um that chocolate drizzle? Whatever it is, it is addictingly delicious. The cookies come together so quickly and you can even prepare the dough days in advance. Then whenever you’re ready for them, just slice and bake. It just makes life on busy days, when cookies are in need, that much better. They do need to sit in the freezer for at least thirty minutes though before you bake them. This helps keep all that butter intact while baking. I know chill times on cookies are so annoying, but you can’t skip the thirty minutes in the freezer. It actually works out perfectly though, because while the dough chills you’re going to want to take your can of sweetened condensed milk and lightly caramelize it on the stove. Typically when caramelizing sweetened condensed milk, it is called Dulce de Leche, but I didn’t want such a strong flavor, so I only cooked the milk for about twenty-five minutes. This creates a super light caramel color and flavor. It’s more like a sweet vanilla cream sauce than a caramel, and it may just be my new favorite sauce. Like wow, so good. 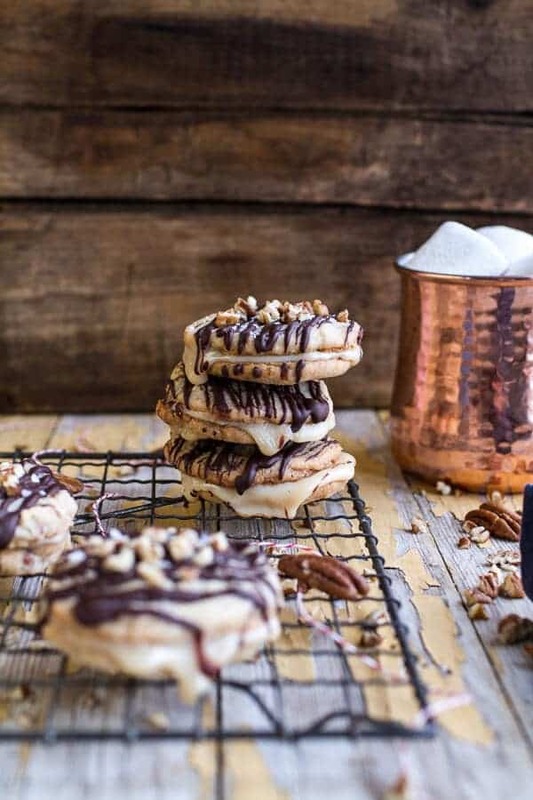 If you love sweet vanilla things, these are so the cookies for you. The chocolate drizzle just kind of seals the deal. Sure the cookies would still be good without it, but I mean, adding chocolate never fails. So DO the drizzle. Geesh, I hope so, or you are reading the wrong blog. And I just have to say, thank God for Friday!! Now let’s eat all the cookies… with a side of hot chocolate. 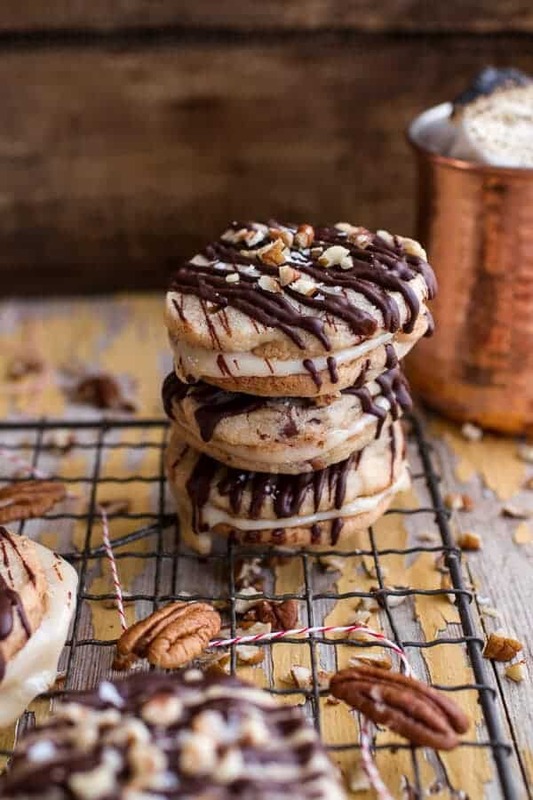 Chocolate Drizzled Buttery Pecan and Caramelized Condensed Milk Sandwich Cookies. They are different from most cookies I make because they are a shortbread base. Honestly, I am not normally a shortbread cookie person, but these cookies just work. Maybe it's all the butter, all the pecans, or um that chocolate drizzle? Whatever it is, it is addictingly delicious. In a large mixing bowl or bowl of a stand mixer, combine the butter, brown sugar, sugar salt, and 2 teaspoons vanilla. Using a stand mixer or hand held mixer beat the mixture until it is smooth, scraping down the sides a few times. Add the flour and water, beat until combined. Place the dough on a large piece of parchment paper or plastic wrap. Using your hands, shape it into a log 10 inches long and about 2 inches in diameter. Wrap the dough up and place it in the freezer for 30 minutes or the fridge for 2-3 hours. Unwrap the dough and place it on a cutting board. Using a knife, cut the log into 1/4 inch slices. Arrange the slices 1 inch apart on baking sheet. Bake the cookies for 10-14 minutes, their edges will be golden brown. Allow the cookies to cool before filling. Once the cookies are cool, spread the bottom half of the cookies with the caramelized sweetened condensed milk. The sweetened condensed milk will be very thick, just be gentle spreading it onto the cookies. If needed, warm the sweetened condensed milk over low heat until just spreadable. Add the top cookie to make a sandwich and place the sandwich cookies on a parchment lined baking sheet. Melt the chocolate over a double broiler or in the microwave on full power, stirring every 30 seconds until smooth. 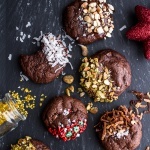 Drizzle the chocolate over each cookie and if desired sprinkle with flaky sea salt. To harden the chocolate, place the tray of cookies in the fridge for 5 minutes. Store cookies in an airtight container for up 4 days at room temperature. *If desired, you can continue to cook the sweetened condensed milk until it reaches a deep caramel color. This will take about and hour over low heat. Essentially, this is called Dulce de Leche. Triple Chocolate Truffle Cheesecake Cookies. 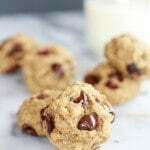 Super Healthy Breakfast (or anytime) Cookies. 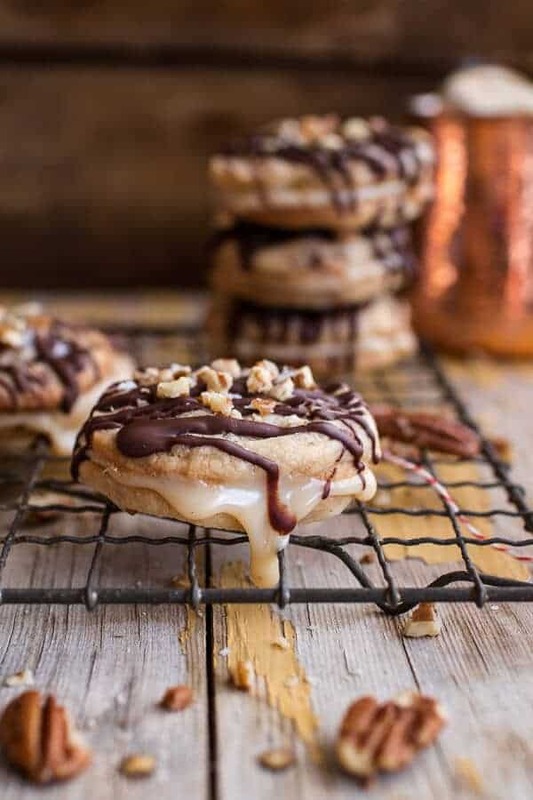 Double Trouble Chocolate Chunk Peanut Butter Honey Cookies. 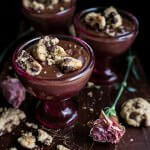 Kahlúa Chocolate Pudding…with Oatmeal Chocolate Chip Cookies. 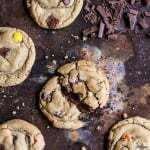 I bake cookies all year long and love them – no season for me! Definitely need to try these.That filling is killing me!! Thanks Katrina! Hope you are enjoying you weekend! Let’s not talk about cookies–let’s eat. It was 82 on Monday last week and miserable Halloween night. Hope you continue GOOD barn weather. It’s soup and cookie weather here. Thanks Nancy! Hope you are enjoying your weekend! Oh buddy! These look amazing! Like holy crap, I want them and my giant hot chocolate right now amazing. I’m worried if I made these I would consume the entire tray. Is that bad? Haha! Thank you so much, Heiley! Marvelous shortbread base of these cookies! It’s always cookie season for sure. Cookies warm the heart and are perfect while playing Settlers of Catan or Bananagrams for that matter. I am going to make these for Gus, but will sub Hazelnuts his fav…for our 53rd anniversary on 11-11-14. They look devine. We will escape for a mini road trip and can’t wait for his reaction when he sees them and takes his first bite. thank you so much. AWE! That is so awesome. I hope they are a great and delicious anniversary treat!! Enjoy! I’m pretty sure cookies like these are always in season! Ok. 1. It is TOTALLY cookie season. At least it better be because that is all I have been working on. 2. I will stop working on my cookies..so I can eat these! Shortbread is my FAV!!! Pinned! Thanks so much and I hope you are having a great weekend! What on earth have you done to me? I’ll be baking this weekend, is what you’ve done. These cookies look amazing. Thanks for a great idea. Pinned. Hah! yea! Thank you so much, Lea! I hope you are having a great baking weekend! Your food is art and heaven! Congratulations! Thank you so much! Hope you are enjoying your weekend! K, those cookies look ridiculously delicious! Shortbread and chocolate AND caramelized condensed milk?! Just. stop So good! Also, that hot chocolate is calling my name right now. Thank you so very much! I hope you are having a great fall weekend! The cookies look amazing, but you are distracting me with that beautiful copper mug! Where did you get it? Thanks Lindsay! The mug is from Williams-Sonomoa. You can fine them here. I agree with everyone else – there is NO cookie season. Cookie season is simply called 2014, and soon 2015. And I am ALL about lightly caramelized. I actually just spread sweetened condensed milk on toast straight from the can, so this is way up my alley. Thanks so much for kind words and I am totally trying condensed milk on toast! YUM! 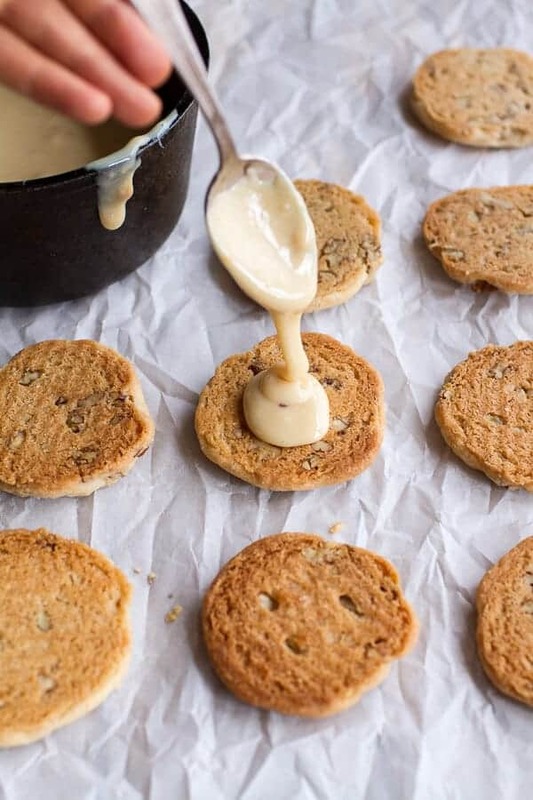 Caramelized condensed milk is fabulous in cookies! I used to work at a bakery that made “Maureos,” which were basically chocolate shortbread cookies with caramelized condensed milk in the middle. Yours, I dare say, look even better! Whoa! Those sound incredibly awesome! Thanks so much, Sarah! Hope you are enjoying your weekend! I make cookies all year round. Even when it’s blazing hot and humid outside 😀 For me, winter is pie season. Starts in September and ends somewhere in May. I consider anything below 70 degrees to be winter haha Even if that’s in August, like this year. luckily my appetite for cookies is not seasonal, so I would eat this anytime! Cheers to cookie season starting NOW! These are beautiful, lady! Can I raid your office for the delicious cookies you’re stockpiling?! Have a great weekend, hun! Thanks Julia and I hope you are having a great weekend! OH MY GOSH! Pretty sure I gained weight just looking at these, amazing!!! I definitely bake better when it’s snowing! These are just so gorgeous! Bring on the snow! Yes, bring on the snow! Thanks Maria! Your posts always leave me drooling. YUM. Thank you so much, Brenda!! Hope you are enjoying your weekend! These look fantastic…and incredibly dangerous. I would eat them all. Thanks Jamie! Hope you are having a great weekend! OMG! This is ridiculous! Gotta do this! Thanks Michelle! Hope you love them! I adore shortbread cookies! These look so good! And the caramelized condensed milk – I would eat it with a spoon! 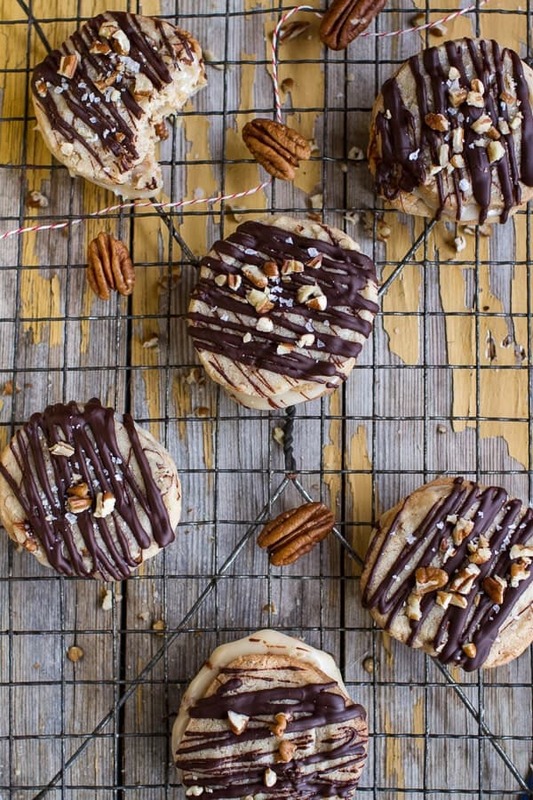 Yes please to buttery pecan and chocolate goodness, these cookies look so good! 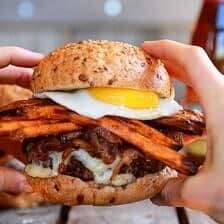 Your food always makes me say “holy crap!” and then get into a drool war with my friends in your IG feed (eek, sorry!). BUT these are gorgeous! And I love that you used your MULE mugs for hot chocolate, because I’ve been eyeing mine and almost doing that too! Totally doing it now! Holy crap, AWESOME!!haha! 🙂 This comment totally makes me smile, thank you! And thank you for the ice cream trick, totally trying that! Thanks again for the sweet words! 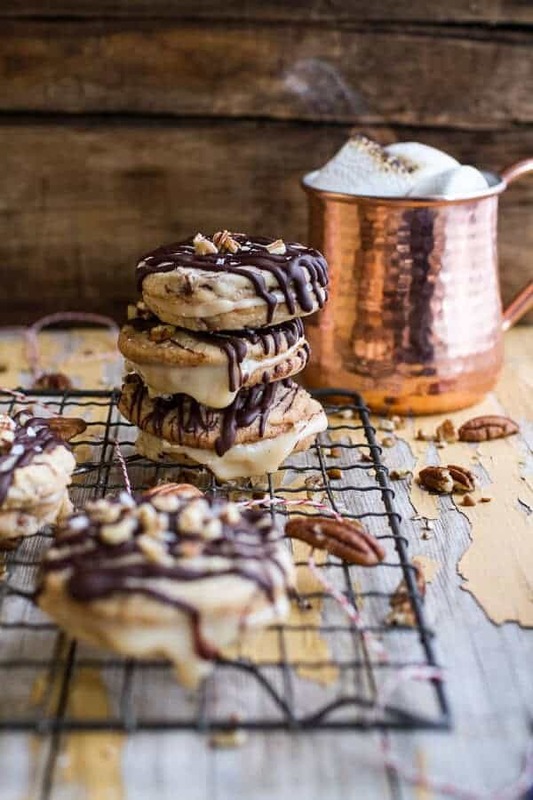 These are such gorgeous looking cookies and I love how you placed that copper jar in the pics!! Thanks Ami! I hope you are having a great weekend! ALWAYS do the chocolate drizzle!! YES! I’m totally ready to take cookie season head on! 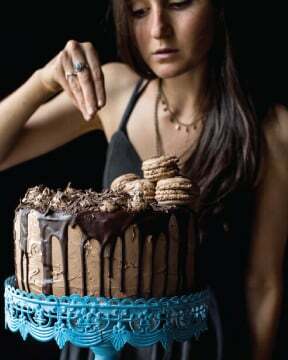 Chocolate drizzle is totally necessary in my book! YEA!! So happy you are ready for the cookies! 🙂 Thanks so much, Lisa! I love baking cookies all year round 😉 If I used the condensed milk as Dulce de Leche, would the filling become thicker? Because I would love to send someone these cookies, but the filling would need to stay inside. Yes, the filling would be thicker, but the condensed milk filling is thick too. My photos show the filling runnier than it actually is, but as they sit they stiffen. Either way would work great. Hope the cookies are a hit and pleas let me know if you have anymore questions. My favorite part of Thanksgiving is having my family all together, the sound of laughter and the smell of cranberries! 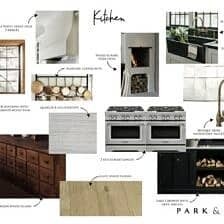 Saw these on Pinterest and began admiring your photography style. 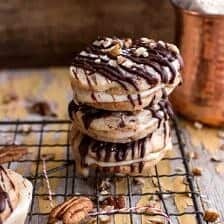 One comment — caramelized condensed milk is also called “dulce de leche,” or milk caramel, so that these could as easily be called “chocolate ganache butter pecan milk caramel cookies,” (even if just in your keywords /wink). Thanks for the photo lesson! 🙂 I really did, thank you! Oh my gosh. These are fantastic! Ak! These look so good. Think I might have to add these to the Christmas cookies this year. Hello, if you could please clarify something. When do you add the 1/4c of sugar? I am assuming when i add the brown sugar to cream it? 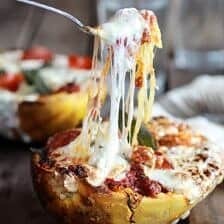 I want to make these but need to be sure. Thank you and these look amazing!! Yes, that is correct. Sorry about that, I will fix the recipe. Hope you love it! 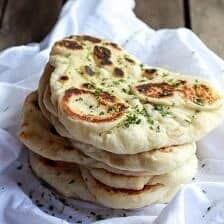 I just wanted to update and let you know how grateful I am for this recipe. I have made these numerous times now. I made batches for Christmas for people and everyone Loved them! I have since gotten request to make more. Thanks again. through some off the post I realized it’s new to me. Anyhow, I’m definitely glad I founhd it aand I’ll bee book-marking and checking back frequently! Anyhow, I’m not sure I understand how much butter to use here and I really want to make these cookies! Is it 2 sticks? Awe!! Thank you so much, Laura! 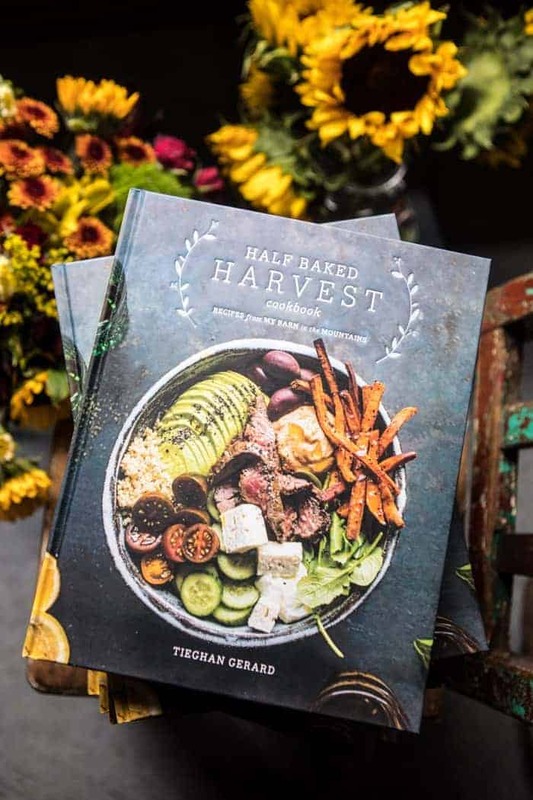 So happy you are enjoying my recipes!! It is 2 sticks of butter. So sorry for the confusion. Let me know if you have other questions. Hope you love the cookies! Thank you so much Erica!! So glad you like these cookies! Just made these this weekend! They were a hit- everybody loved them! 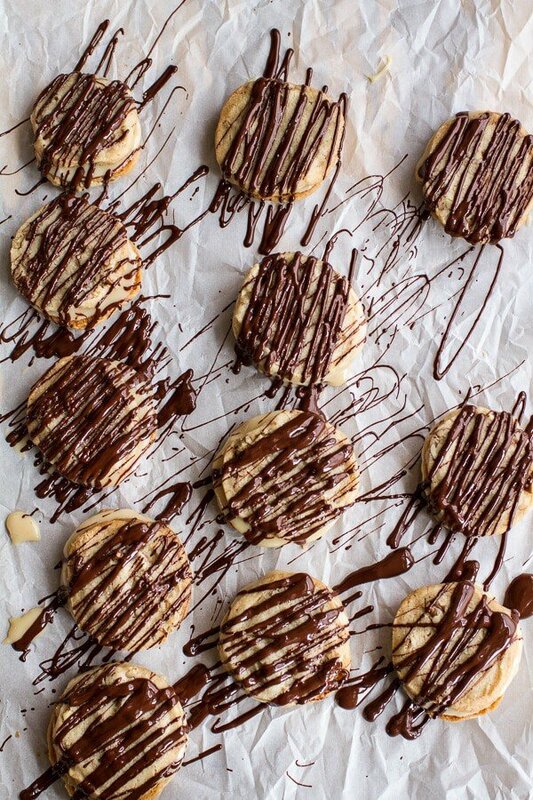 The only trouble I had was the top cookie sliding off when I put the cooled condensed milk on top, but I just pushed them back in place and they stayed put after I stuck them in the fridge with the chocolate drizzle. I’ll definitely make again! I am so glad these turned out so well for you, Stefani! Thank you!